Home » astronaut pen » fisher space pen » moon » Pen Trivia » Pen Trivia - What date did man first land on the moon? 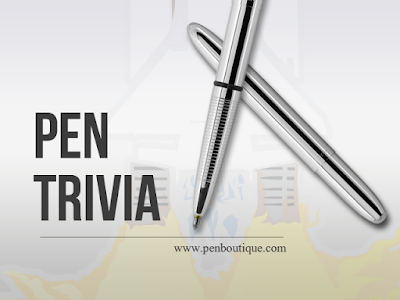 Pen Trivia - What date did man first land on the moon? Of course a pen’s primary use is to write. Sometimes, however, they become magical instruments. A Fisher Space pen earned its astronaut wings most famously during the Apollo 11 flight. An arming switch that allowed Buzz Aldrin and Neil Armstrong to lift off from the moon’s surface broke and they used a Fisher Space pen as a substitute lever earning a place in the official mission log and space flight history. Questions: What date did man first land on the moon?